Davidson Wildcats Take Down No. 1 Rhode Island in a Close Finish. WASHINGTON D.C. – On Sunday afternoon at Capital One Arena, No. 3 Davidson and No.1 Rhode Island took the stage for the A10 Tournament Finals. 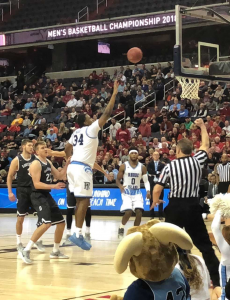 This setting was familiar to Rhode as they had won the Tournament last year, however, Davidson was the outsider, this was there first time ever being in the A10 finals and they did not waste their opportunity. Davidson squeaked one out and won by a score of 58-57. Let’s break it down. Two minutes into the game Davidson lead 6-2, but as they progressed it was neck and neck throughout. However, Davidson, did gain as much as an 8-point lead at multiple times during the game. Going into the half, URI lead 33-32; I knew this was going to be a lot closer than what I had initially thought. Out the locker rooms, the both teams went back and forth with lead changes, but no one was pulling ahead. Davidson however went on a 12 minute and 50 second scoring drought and Rhode Island gladly took advantage scoring 11 consecutive points, while at the same time gaining their biggest lead with a score of 56-52 with just under four minutes left. With 2 minutes left to go, Kelley Grady made it 57-56 with two shots from the charity stripe. And when clutch time called, Grady answered with a game-winning floater on the next possession. Davidson had to be alert with Rhode Island’s Jeff Dowtin going for a shot, and they were as they forced him to take a deep three that came up short. With 0.6 left in the game Davidson inbounded to half-court and sealed the championship game. No. 3 Davidson takes down No. 1 Rhode Island in a grand fashion. Having received an automatic bid tonight, Davidson will travel to Boise, ID to take on Kentucky in their 14th NCAA Tournament. That will be a game to watch. Davidson went 19-50 (38%) on field goals, 6-18 (33.3%) on three pointers, and 14-16 (88%) from the foul line. Kelley Grady lead the Wildcats with 17 points and 3 rebounds in this one, while Peyton Aldridge grabbed 7 rebounds and 2 assists in addition to his 13 points. KiShawn Pritchett and Jon Axel Gudmundsson each finished with 9 points and went 75% (3-4) from the foul line. Rhode Island went 20-52 (38.5%) on field goals, 8-23 (34.8%) on three pointers, and struggled from the charity stripe with a 52.9% (9-17). Rhode Island’s points where spread thin among their players, with only E.C. Matthews making it to double digits (20). Rhode Island received an At-Large Bid tonight and will play Oklahoma in Pittsburgh. In other A10 news, St. Bonaventure also received an At-Large Bid tonight and will face UCLA in Dayton, OH. Stay tuned for more sports articles on WGMU in the near future.